Let me know what you think !!! I dont see the point. thelad wrote: :dizzy: I dont see the point. That's because with your new Tetra detector you can see round corners. Have I lost the plot here? You can hear a radio transmission from towers you cannot see - we do it every day? Are they getting confused with radar? TETRA isn't radar? I don't get it? G4RMT wrote: Have I lost the plot here? You can hear a radio transmission from towers you cannot see - we do it every day? Are they getting confused with radar? TETRA isn't radar? I don't get it? They are selling it as a suggested way of avoiding speeding fines etc. But I am not sure how they are suggesting it can help. 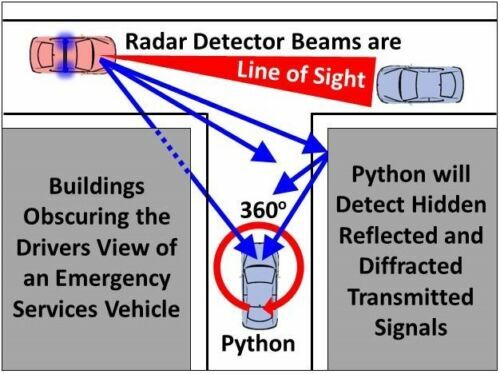 Python Detectors will provide a warning alert when they detect a transmitted signal from the Radio of an Emergency Services Vehicle. The Emergency Service Vehicles Radios constantly transmit their location to the network and the Python Detectors will detect these transmissions. 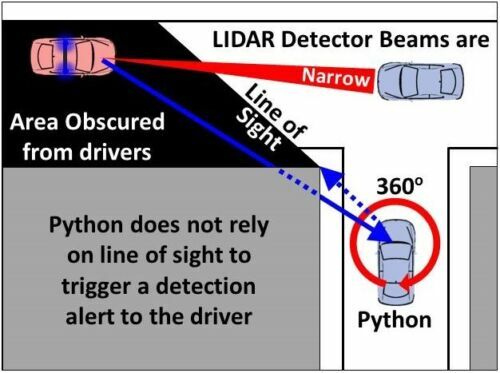 This means that a Python Detector can register a detection from Emergency Service Vehicles which may not be involved in speed awareness detection and which are not in your direct line of sight.